One night after the Mauna Kea ascent found me 40 feet underwater, again gazing skyward with a group of toursits like myself. But we were not searching the heavens for mythic beasts. We wanted real ones. We wanted Manta Rays. The scuba trip was advertised bluntly as the Manta Night Dive, the only such dive in the islands and famous for it. It had developed accidentally, we were told. Some years back the Sheraton Hotel installed large lights along its bit of coast to illuminate for its guests what is, after the sun sets, utterly black and undifferentiated sea. 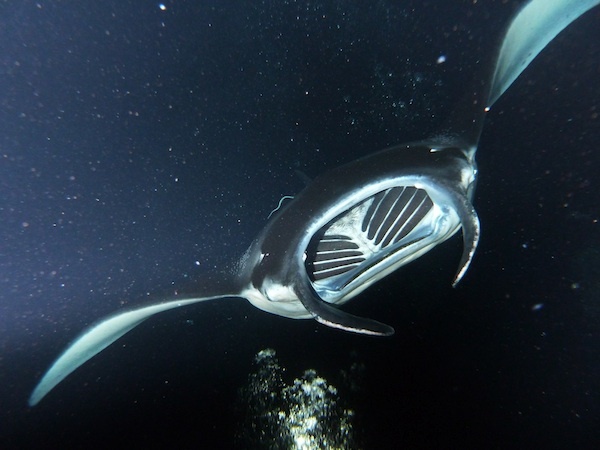 The lights attracted plankton, which attracted plankton feeding animals, like Manta Rays, and the Mantas attracted … divers. Soon every dive company in Kona had a Manta dive, requiring other locations to be found or manufactured. Our boat of fourteen divers arrives late. Garden Eel Cove (one of the alternate Manta sites) just off a rocky bit of coast near the Kona Airport, already contains eight other boats bobbing on the swell. We moor, suit-up, and dive the cove in the remains of the day so as to have our bearings when night falls. We find a bouldery, coral bottom that gives way to rubble without coral that then falls to sand. Here Garden Eels protruded from their hidey-holes like short lengths of licorice rope swaying in the current. We return to the boat as an orange sun touches the horizon. Aspects of the Manta dive have about them the aura of communal religious ritual, and in keeping with such there are lots of rules. As we suit-up in the dark, our dive master, Mongo, reviews these twelve commandments in detail. 1. Go right to the bottom; do not dally. 2. Stay on the bottom and in your assigned station; do not wander up into the water column where you may be crashed into. 3. Shine your flashlight straight up. Hold it in front of your face, and resist the urge to move it around (this aids in the build-up of plankton intensity and thus Manta attraction). 4. Sit still before the Mantas arrive; sit still after they arrive. Sit still. 5. If you think a Manta is about to collide with you, continue to sit still. Mantas know what they are doing. If one does collide with you and rips your mask away, do not also spit out your regulator as this will ruin your dive and piss off those who must rescue you. 6. 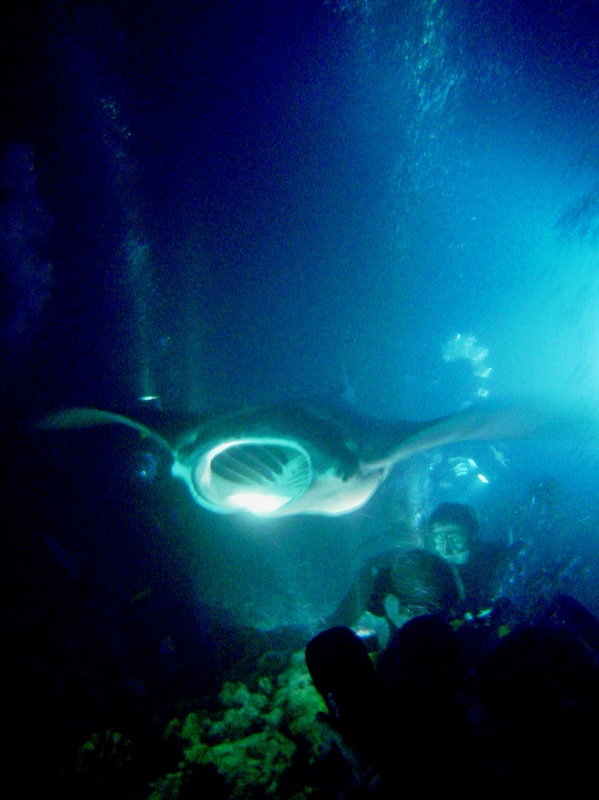 Resist the urge to touch the Mantas as they pass inches from your face. This could injure their slimy, protective coating. 7. Do not exhale bubbles into the Mantas mouth. They breath water, not air. But DO NOT hold your breath as they pass as this, combined with all the other excitement, may lead to fainting. 8. Do not shine your light in the Manta’s eyes, nor into your dive master’s eyes, nor into those of your neighbor diver. Doing so is unkind and may result in your being punched (by your neighbor). 9. If you think you have been bit by a manta, remember that they don’t have teeth. If you think you have been stung by its long tail, remember they don’t have stingers. Manta’s don’t have weapons. They can’t hurt you. 10. Be in charge of your own air. Do not ask your dive master how much air you have because he too has forgotten his prescription mask and can’t see the gauges any better than you. 11. When in transit to and from the boat, stay with your group (denoted by differently colored lights attached to the tanks of the different groups). Divers who return to the wrong boat will be made to return to the right boat via the “surface swim of shame”, which will be filmed and posted on YouTube. 12. Scream as much as you want, just stay put. By this time more boats have arrived and the tiny cove is out of moorings–boats are tethered in-line to each other. The water top is a chaos of bobbing black suits and small lights glowing different shades of pastel. Our group of seven divers splashes last. Once on the bottom, we find the pews are full; the congregation already seated. Mongo moves us to a rocky patch in the back and plants us in our spots. The cove floor now contains well over a hundred divers distributed in a rough circle, all facing inward. Each carries a bright light, as do the many snorkelers floating on the surface whose beams move in every conceivable direction as if we, together, are here for the purpose of creating a large, aquatic disco ball. So much light fills the cove that it feels like an unevenly lit room. Very possibly we are inside an aquarium. Everywhere rushes of bubbles cascade toward the surface, sparkling in the frenzy of light like showers of stars falling up. Schools of silvery fishes add the flash of comets. The cove is positively abuzz. And in this state we wait. For maybe ten minutes. Only the younger divers are impatient. They wander off and are returned to their seats by Mongo with a hand motion, “Stay!”, that one might use on a dog. Slowly from the dark perimeter a dark, undulating form. Slowly and steadily it flies into the light, its wings curving and releasing, tipping and turning without flapping like a bird’s, and yet the animal moves forward as if otherwise propelled. Slowly it flies through the whoosh of bubbles and out the other side into the dark. Then nothing; nothing but the sound of collective breathing. Then from another point of the unlit perimeter, two more shapes approach and waft themselves into the light as if they are so much liquid smoke. I grip the rock with one hand and shine my beam with another and wonder how to describe these animals. They are most like giant bats in shape, but they don’t remind of bats at all, rather what comes to mind is that their heavy, deliberate, yet weightless grace is much like that of flying elephants. This analogy is inept and ridiculous and I laugh, almost coughing up my respirator, yet it stands as the best I’ve come up with. Then there are three Mantas, then five, swinging through the circle. Most have a wingspan of six to eight feet, their great, white mouths, large enough to swallow me head and shoulders, agape, toothless cottony cavities bordered by antenna-like scoops. The bellies are white and spotted with grey in a way distinctive to each individual. The top of the animal is entirely black; clinging to it are tiny, shrimp-like parasites. 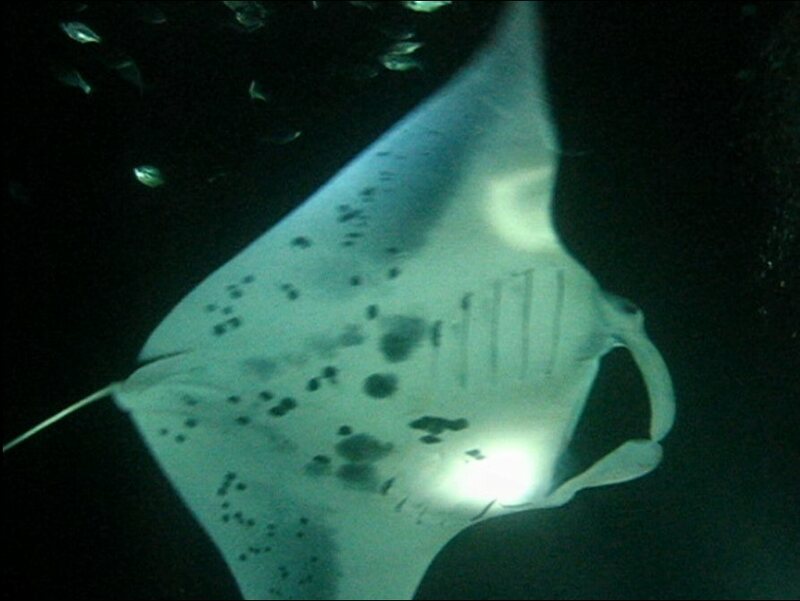 The narrow, ray tail contains no stinger and is as long as the animal is wide. The plankton is beginning to concentrate. I can see small points of light jetting around in my beam, and squirrel fishes dodge in and out grabbing a meal when the Manta’s aren’t close. At eight Mantas I lose count. Now they appear to be everywhere in the dome of light. Some swoop low over the divers (several pass so close over my head I can’t help but duck) while others somersault just below the floating snorkelers, rolling again and again and again. After a time their collective movements, still slow, still graceful, begin to carry a sense of urgency, and at some point there are so many Mantas that a few misjudge their trajectory and collide. I lose track of time. I forget to check my air. And then Mongo is tapping me on the shoulder. He collects our group for the remainder of the dive, and we wander off into the dark where we find a cuttle fish hovering in anticipation and a slipper lobster running away. Thank you Randall for taking your time in such a detailled story about the manta experience. Your writing is quite lyric and impressive. I did not know that this is possible in Hawaii. And thank’s to Mongo that he is such a reasonable dive master who knows the most important things about repectful behaviour under water and that he does not only talk but care for all the divers obeying the rules under the water, unfortunately too many divemasters dare the conflict with guests or do not even know what to say in the briefing. I learned a lot from this briefing and will print it out. Manta watching should always be done like this. We did such a night dive during a boat trip but there was no guiding at all and the briefing was short, resulting in star wars under water. I had the impression the peaceful mantas were feared but still they stayed for the feeding. Nevertheless it was very impressive havin mantas so near. 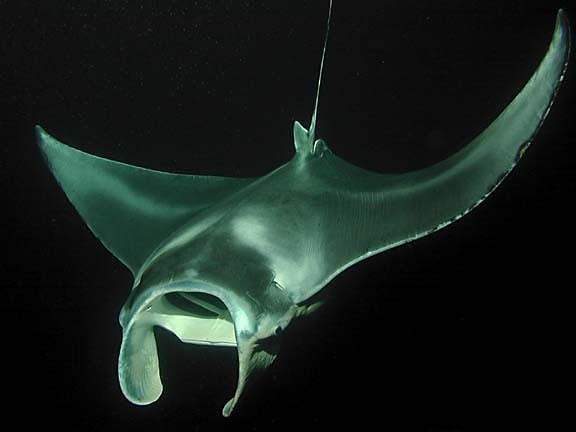 Mantas are exceptional navigators. Hopefully upcoming manta finning does not prevent us from doing this. Glad you found the post fun and useful. Must admit, I thought Mongo’s approach much like that of a teacher leading a group of first graders on a field trip, which offended me … until we splashed, and then I understood. It was a circus of divers below and those of us in the Jack’s Diving Locker group were the best behaved. A good thing. Very unusual and very worthwhile dive.